Lately, Google released a newer version of androids operating system which is the Android 5.0 Lollipop. And this latest Android OS comes with loads of unique and more advanced features than the previous ones. Previously, I published an article that explains the “5 Major things you need to know about the Android 5.0 Lollipop”, I encourage you take a stroll to that article, and with the content in it, you would fall in love with the new Android 5.0 lollipop. Today's stroll, I would brief you guys the best way in which you can easily install Android 5.0 lollipop on Nexus 5 and Nexus 7 Smart phones. Precaution: Ensure you backup your Nexus 5 or Nexus 7 Smart phone before proceeding to the installation guide. ● First off- Download the ABD files with your PC and extract the downloaded files to the desktop screen of your computer. ● After you have successfully extracted the downloaded file to the desktop screen of your computer, then you are to download the android 5.0 lollipop preview for Nexus 5 via here and Nexus 7 via here. ● Once you have successfully downloaded the preview for any of them, then extract there “tgz file” to the desktop of your computer for proper installation of the android 5.0 lollipop. ● Then Copy all the “tgz files” that you extracted to your desktop and paste them to that “ABD Folder” that you downloaded in the first step. ● Once you have successfully pasted all the tgz files, then you are to enable USB debugging on your Nexus 5 or Nexus 7 device. To Enable “USB Debugging”, simply go to “Settings” on your Nexus device, then scroll down to “About Phone” option and select “Build Number”, then tap it up to 7 times and the developers menu would be visible, then enable USB Debugging from there. ● Once you have successfully enabled USB debugging on your Nexus device, then you can connect your Nexus device to your computer through the use of USB cable. ● Once your Nexus device is connected to your computer, then open the command prompt window on the ABD Folder. To open this function, simply hold the “Shift” button of your computer and with the help of your mouse, “Right click” the white space of that ABD Folder and then click on the “Open Command Window here” option. ● Then input the below command inside the command prompt. With the above command, you would see the full list of connected devices on your computer via serial number. If the serial number of your device is not shown, then try and re-install the drivers properly. ● After the above step, input the below command, so that the Bootloader of your Nexus device would be unlocked. NB: You won't be needing to unlock the bootloader of your Nexus device if you have unlocked it before. ● Then, input the below command to boot your Nexus 5 or Nexus 7 device to fastboot mode. ● After you've input the above command, your Nexus device would be on fastboot mode. Then move to the ADB folder (that file you downloaded in the first stage) and click the “Flash-all” file that is in the ADB folder, and the installation process would start immediately. 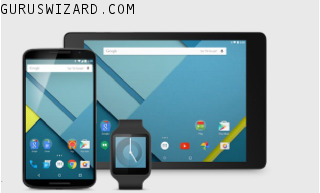 ● Once the installation process is completed, your Nexus 5 or Nexus 7 device would reboot. Then you can successfully eject and disconnect your device from your computer. Congratulations. The Android 5.0 Lollipop preview would be live on your Nexus 5 or Nexus 7 device after your device is fully rebooted. Hope this brief guide helps. If you encounter any problem during the process of installation, please do let us know in the comment section, and I would kindly see to the solution. You can also check our Android section for more android tips and tricks.